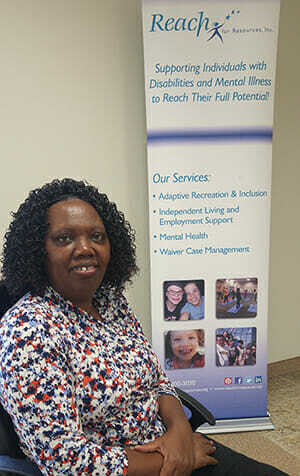 Ask Margaret Nyoike how she’s doing, and the response will usually be “blessed.” This simple but meaningful response captures the attitude Margaret portrays in her job at Reach for Resources. As a Community Living Specialist at Reach for almost two years, Margaret loves making a difference in people’s lives. Margaret explains that she never considers it a burden beginning a work shift, but more of an opportunity to inspire. She has had several different jobs before this one, but Margaret describes Reach as her home. With down-to-earth bosses, she feels like she can go to them for anything. Margaret highly recommends working for Reach to anyone who wants a stable job and wants to change lives. When Margaret first starts working with individuals, her goal is to discover what their dreams are. Once their dreams are discovered, Margaret does everything in her power to make those dreams achievable. One of individuals Margaret is currently working with is a young mother who has a dream of becoming a nursing assistant. Although they were faced with a few obstacles on the way, Margaret has helped so that this woman is now attending nursing school. When Margaret meets with her twice a week, they work together on medical vocabulary and assignments. Margaret can’t wait for the day she sees her graduate and move on to a nursing job. When driving individuals around, Margaret sets aside her smartphone’s directions and asks them to help her get to the destination. Margaret expresses how important it is to “let them feel like they’re a part of what they’re doing.” She believes this engagement of small, daily things makes us more human. Every individual Margaret supports is special, and she wants to give them something to look back on positively when they go to bed that night. No matter the age of who she’s working with, she asks herself, “If this was my child, what would I do?” After answering this question, Margaret blesses people through her positive take on life.